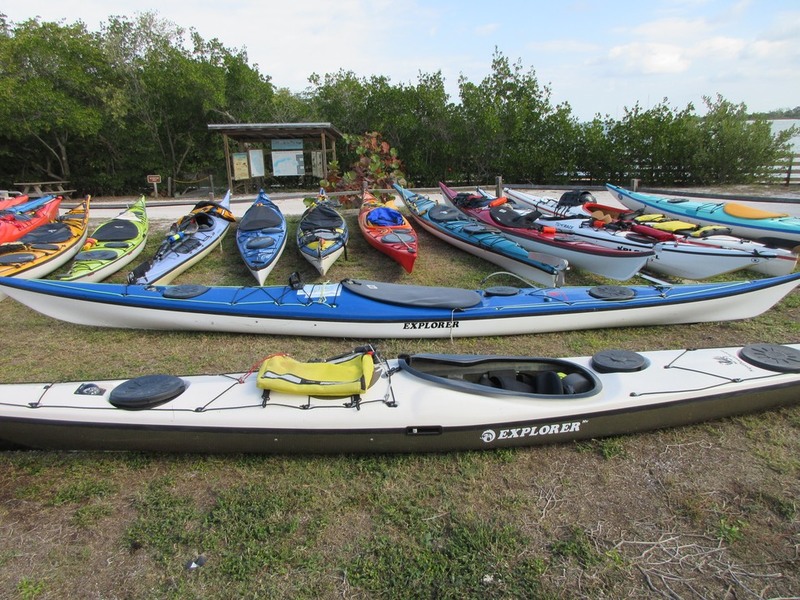 I registered for this Paddle Florida trip because it was new and because I had wanted to go to Cayo Costa State Park for some time. I had paddled sections of the Calusa Blueway before, having heard all of the Chamber of Commerce hype about the Blueway Trail. The Blueway is nice and well laid out, but it is too civilized for me. Even though you paddle in and out of areas that feel isolated, this sense doesn’t last, because around the corner is a condo, a marina or a speeding power boat. Actually, the Blueway seems set up to accommodate day paddlers rather than trippers, and it works rather well for that. 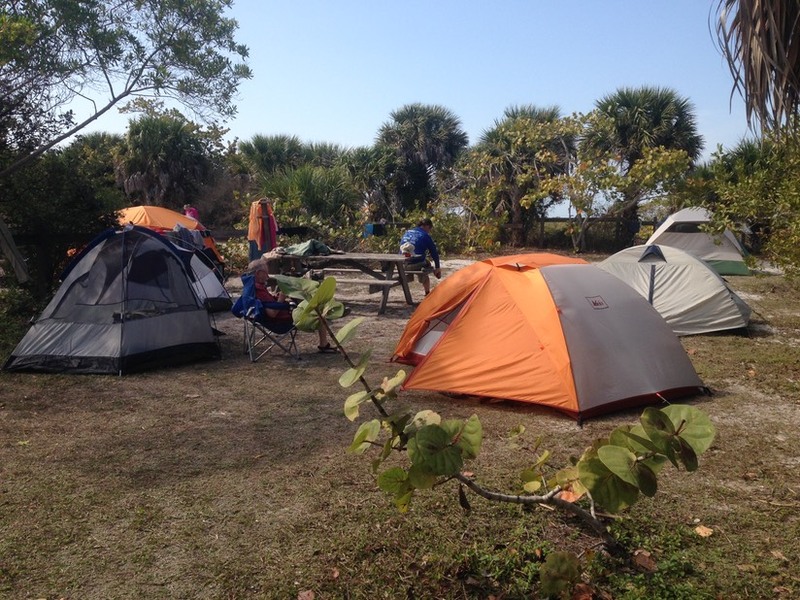 Paddle Florida Trips offer the convenience of a preplanned trip with the logistics of routes, camping locations, meals, gear transport, entertainment and shuttle services, all provided at a reasonable cost (see Paddle Florida.org). These are group trips of about forty paddlers on average. They provide a different experience than the self-planned, self-supported trip with a few friends. Both experiences have their strengths. 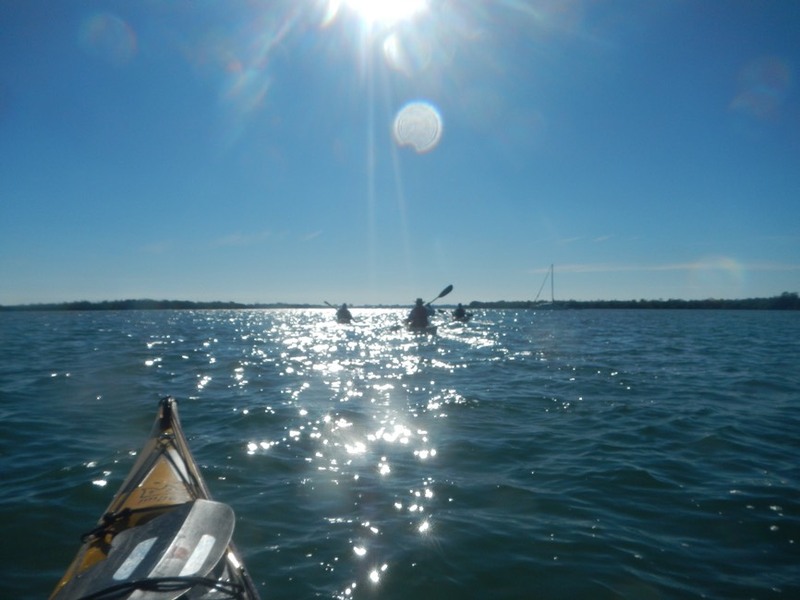 Aside from seeing parts of Florida I might not otherwise know about and making new friends from across the state and country, Paddle Florida offers convenience. It takes me only a few days to get ready for a PF trip, whereas it might take months to prepare for a self-supported trip. 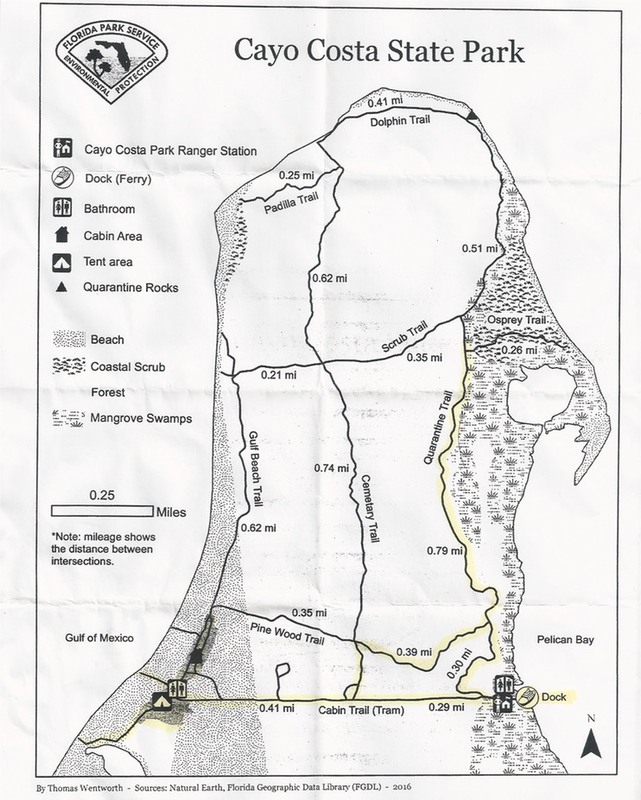 DAY 1: Our jumping off point was Koreshan State Park which houses the Koreshan State Historic Site. The Koreshans were a religious cult, contemporary with the Shakers and other utopian groups. Its founder, Cyrus Teed, used the Persian version of his first name, which is Koresh, to name the movement. Cult leader Vernon Wayne Howell took the name David Koresh from the Koreshans. He and his Branch Davidians died on April 19, 1993 in a Waco, Texas shoot out with Federal authorities. We would camp there overnight, leave our vehicles while we paddled, and be shuttled back from our take out on Pine Island seven days hence. DAY 2: Next morning we headed for Mound Key, our lunch stop, and on to Bowditch Regional Park where we would spend the night. The trip would be about eleven miles in length. Conditions were good with moderate temperatures in the sixties and easy seas. We did a lot of paddling in open water, which is not my favorite. I prefer to be closer to shore where I can see the flora and fauna that live there. Because most of us were unfamiliar with the route, we stayed with the leaders. Bill Richards, Paddle Florida CEO, had set up three groups of paddlers: the fast group out front, an average speed group in the middle, and a slow group of paddlers bringing up the rear. I was in the fast group. 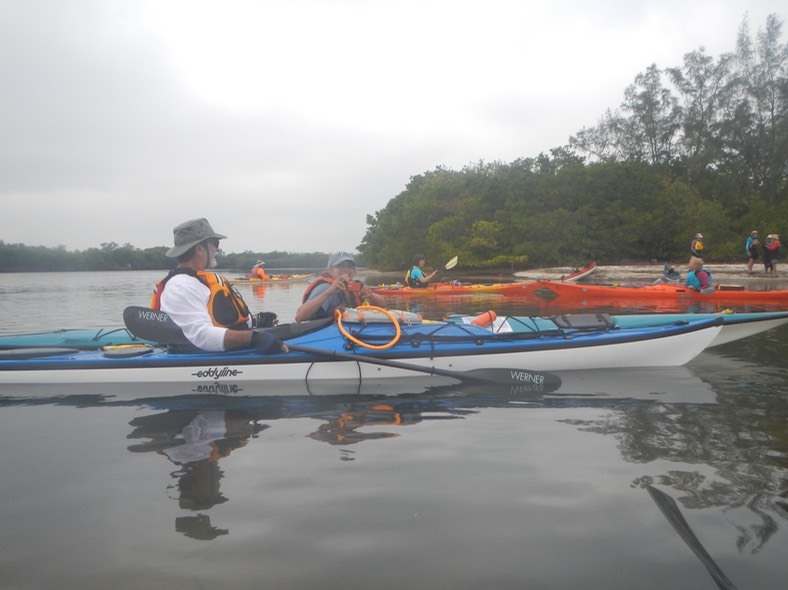 We did some paddling in narrower mangrove areas, but often we were out in the open. When I paddle in open water for hours, I tend to set up an automatic cadence that requires little attention, and go inward, letting thoughts and feelings come as they will. This is not without its own rewards, but I prefer being nearer to shore life. 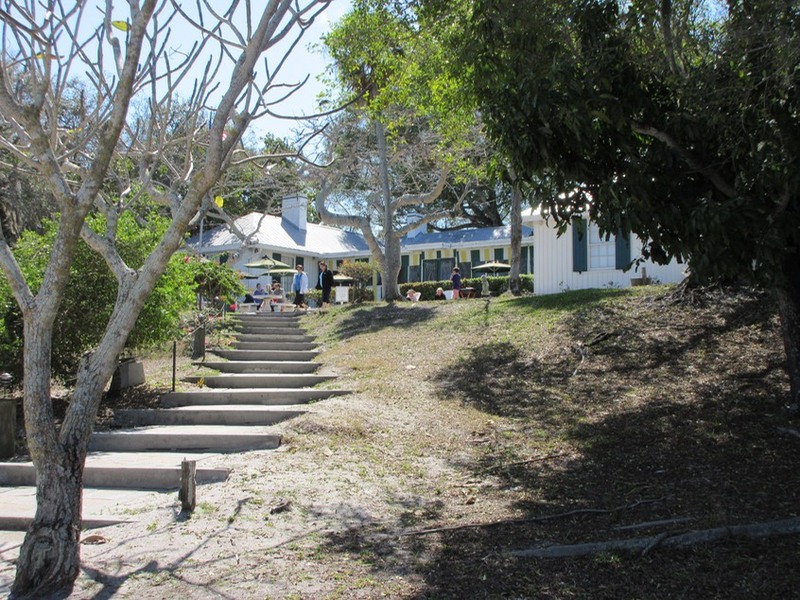 Our first stop was Mound Key Archaeological State Park. Mound Key is a Calusa Shell Mound island. It was an important religious and political center for the Calusa Indians before the Spanish arrived in the sixteenth century. It’s unfortunate that we didn’t have time to explore the site, as we were only there for a short lunch and bathroom break. At some point I’d like to return. We arrived at our camping spot around 2:00 pm. The various paths from our landing at Bowditch Regional Park were very confusing. They led in every direction, and of course, I took a wrong one. Eventually I found myself in a lovely spot at the back of the camping area. I claimed an area, set up my tent, and spent much of the afternoon relaxing in the shade. After dinner, we were entertained by a guitar player who led us in a sing-a-long. One paddler named Henry had a loud, off key, off rhythm, and out of sync voice. I was told he was hard of hearing, but I’m not sure that explained it all. It was jarring, but Henry didn’t know it and was having a great time. This video is a musical montage of our Calusa Blueway Trip. DAY 3: Next morning we were up and on the water by 8:30 am, anticipating an eighteen mile day. Night time weather has been dry so far. By that I mean, no rain. But the dew has been heavy, so each morning we have packed up wet tents coated with debris from the ground and overhead trees. Overnight temperatures have been comfortable, in the low fifties to the high forties. I paddled with the fast group again. We headed across the mouth of Caloosahatchee River, where it meets the Gulf of Mexico, paddling in open water once more. 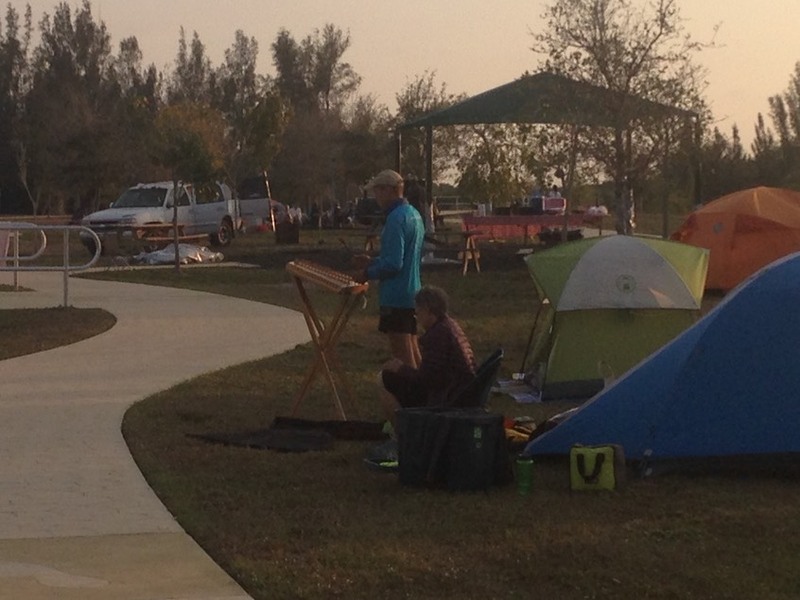 Our takeout and campsite would be at Sirenia Vista Park in Cape Coral. On a long trip like this, the second day always seems the most tiring and difficult, and the length of today’s paddle, combined with long stretches of open water, made it even more daunting. We had our lunch break at Tropical Point Park in St. James City, but I don’t remember much about it. I just remember the seemingly endless slog and the need to keep up with the leader, the one who had paddled this route before and, hopefully, knew where we were going. We arrived at Sirenia Vista Park late in the afternoon. Sirenia is latin for species that include the manatee. The park itself is on open land, separated from housing by a canal where manatees gather in colder weather. Across this spit of land is salt marsh and the Gulf of Mexico. An enterprising group of civic minded people convinced the city of Coral Gables to preserve this land for public use, saving it from development into waterfront condos. It’s a lovely bit of land with sidewalks, pavilions, picnic tables and benches, great for day use, but too civilized for my taste, as I felt like I was camping in a fish bowl. That evening, some folks called Uber for a ride to a local pizza joint and watering hole. But since I don’t drink, I stayed in camp for dinner and afterward was treated to a presentation on the history of the park and an impromptu concert by a local woman, a charter boat captain. DAY 4: Our paddle today would take us a short ten miles to Jug Creek Cottages in Bokeelia. Because the distance to Jug Creek was only about half of what we paddled yesterday, we would have no lunch break until we reached our take-out. At our orientation meeting on Day 1, we were given a chart with routes and GPS coordinates, but I found it to be very confusing. The day numbers (1-7) shown at the bottom of the page had nothing to do with the numbers and letters listed on the chart. The route, shown in red, was a photo copy from a Great Calusa Blueway brochure, but it was not the route we followed. This meant that only a few paddlers who knew the area well could go off to explore on their own, while the rest of us had to stay with our group to keep from getting lost. Camping at Jug Creek was unusual in that we camped among and around the cottages. I remember wandering about, trying to select a level spot that didn’t encroach on the privacy of folks renting cabins. I finally found a spot, but I was never really satisfied with my choice. Paddle Florida had rented a couple of cabins to provide us with showers, which we greatly appreciated. That night we heard a presentation on Florida’s springs by a woman who was very exercised about a cross Florida natural gas pipeline that would be routed under the Santa Fe River, pass near springs, and go through private land. She was passionate, but not convincing, at least it seemed so based on questions from the audience. DAY 5: The day finally arrived when we would head for Cayo Costa Island. By distance, this would be another short paddling day: eleven miles. But distance was only part of the story. From the beginning of the trip I had heard murmurings about the paddle from the mainland to the island. Apparently the wind and seas could pick up enough to make the crossing difficult and even scary for some people. But Cayo Costa was what I had come on this trip for, so I looked forward to whatever the weather gods would throw at me as the tribute I had to pay to get there. Our route took us across open water, partially protected from heavy wave action by low lying islands. We managed to skirt around and behind these when we found them, keeping wave action from the increasing wind at bay. I kept my head down and followed the leader, in the fast group again. Eventually we could make out some docks and low lying buildings in the far distance. As we approached, there appeared a small sand beach to the left of the substantial power boat docks. We went ashore, a few boats at a time, and, with help, carried our kayaks about 100 yards and up a steep incline to a broad flat area, under which was the park’s septic system. 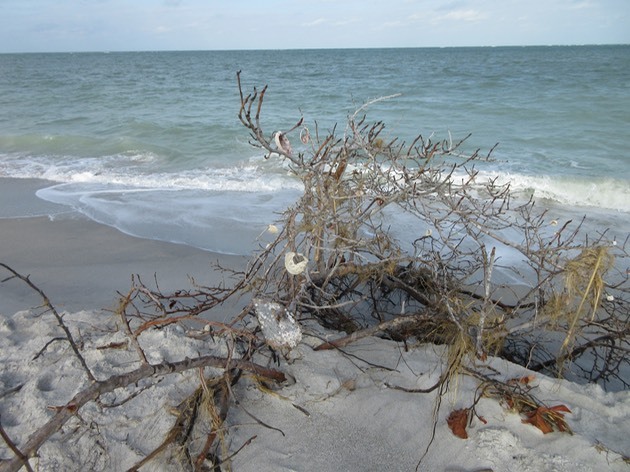 (see the video Cayo Costa Landing). There we unloaded our gear and prepared for the cross island tram ride to the park’s camping area. When enough of us had arrived to make the trip worthwhile, the tram departed, heading west, away from the docks, past the park office and store, and down a straight, tree shaded road on the three-quarter mile ride to our camping area. We were dropped of at the head of the camp road, near bathrooms, a campfire area and an entertainment pavilion. There under a tree awaited our gear bags, transported there before our arrival by ferry and tram. The campsites were large and relatively private, strung along a dirt road that headed south from our disembarkation point. I grabbed my gear bags and walked a short distance to the first open site I could see. It was open in the center, shaded at the sides, and quite spacious. There was one other tent on the site, so I asked permission to camp there before setting up, as we were expected to have multiple tents at each location. After my tent was pitched and I was enjoying the open space the place offered, more and more folks arrived and asked to join us. Eventually there were five tents and six people camped on the site. It wasn’t really crowded, but it wasn’t as peaceful as I had hoped. In retrospect, I should have walked on down the road to the more remote camping areas. But it was pleasant having company and being near the campfire and other rough hewn amenities . It was still early in the day, so I decided to explore a bit. I walked north, up the road in a direction opposite from our tenting area, and found some larger bathrooms with showers, sort of. The bathrooms have running water, flush toilets, and showers, but no electricity. The running water is fed by a gravity system. Water is pumped from wells to an ancient, wooden water tower and distributed by pipe to various locations in the park. The park offices and work areas have an electric generator to provide necessary electrical power and pump water up to the tower. The rest of the park is dark, including the bathrooms: and did I mention that the showers are cold? There’s no hot water. At some point I discovered I had left my cell phone and wallet locked in a dry bag in my kayak. I didn’t want to leave them there unprotected. It was a good day for walking, so I headed east along the Tram Road, slowly strolling back toward the docks. On arrival, I climbed the low hill to the kayak area. The boats were all lined up in a neat and orderly way, creating a rainbow of color in the afternoon sun. I found my phone and wallet and packed them in the little travel bag that Paddle Florida had provided. As I was securing my day hatch for the night, it occurred to me that the array of boats I was surrounded by were all high quality sea going kayaks and this paddling group included the most skilled paddlers I had ever been with. On my way back to camp, I stopped at the park store because I knew they had ice cream. I asked where it was located and was waved toward a freezer at the back of the shop. “Electricity’s out,” said the clerk, “but the ice cream should still be okay.” It was. As I paid for my mostly frozen treat I learned that the island generator had failed and that all hands were busy trying to get it running again. The ice cream didn’t last nearly as long as the walk back to my tent. On the way, I passed a road labeled “Cemetery Trail”. The old cemeteries on these remote islands are often interesting. I made a mental note to come back tomorrow to explore. By the time I reached my tent I was hot and sticky. I thought, “Maybe it’s time to try out that shower.” Gathering my soap, shampoo, towel, and clean clothes, I headed out. When I said, “showers, sort of,” it was because they were relatively crude outdoor showers, attached to the back of the bathroom building, men on the left, women on the right, about twelve feet apart. I could hear splashing from the women’s side. A towel was thrown casually over the stall’s door and a woman’s undergarment (a really big bra) hung on a nail just outside. Privacy in the outdoors is just not what it is at home. Dinner that night was rather miraculous. Paddle Florida meals are catered. How do you get a hot catered meal to an island? It’s easy if the caterer’s father is a commercial fisherman with a big boat. We had hot breakfasts and dinners for two days because of that lucky coincidence. Our program that night was to be on the flora and fauna of the island, presented by a park ranger. He never showed up. We waited patiently in the pavilion until a park volunteer in a golf cart stopped to see what was going on. He told us about the generator problem and guessed that the ranger we were expecting was busy trying to fix it. He asked if we liked music and volunteered to return next night to entertain us. I was kind of skeptical. I really wasn’t into amateur hour, listening to an evening of bad music. There was a campfire that night, not far from my tent. I stayed for a while, then turned in. I awoke several times listening to the howl of a building wind. DAY 6: Since we were staying at Cayo Costa another day, I could sleep in because I didn’t have to pack up gear and knock down my tent. I enjoyed several cups of coffee at the pavilion and consumed too much bacon wrapped in a pancake, a sinful pleasure. All the while the howl of the wind was disconcerting. My plan for the day was to get in my boat and circumnavigate the island. I walked out to the beach. It was beautiful in the morning light. But the roar of the wind and waves beating on the shore told me that it would not be prudent to paddle that day. So I returned to the pavilion and joined a discussion of what could be done with our time. 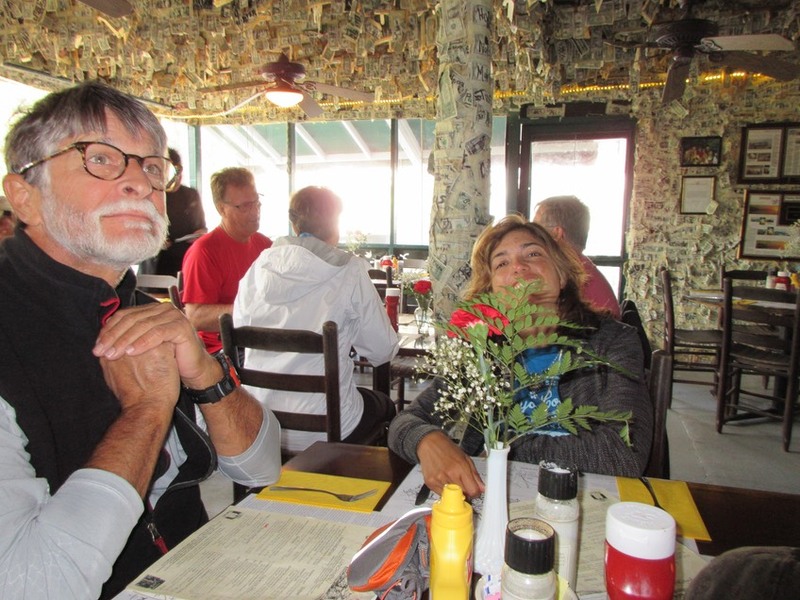 A significant group planned on taking the eleven o’clock ferry to Cabbage Key and the Cabbage Key Inn for lunch at the place said by some to be the inspiration for Jimmy Buffett’s song, Cheeseburger in Paradise. I decided to join them. I went back to my tent, then wandered down the campsite road, looking at other sites. There really wasn’t a bad one. At the end of the road I followed a path out to the beach again. The wind was still howling, but the beach was shimmering in the morning light, beautiful to behold. I walked slowly along the shore, looking for shells and other treasures until I reached the pavilion once more. Returning to my tent, I grabbed a camera and my wallet, and joined the group near the campfire area waiting for the tram to take us to the Cabbage Key ferry. A few of us got tired of waiting and headed out on foot, telling the rest to pick us up if we hadn’t already made it to the dock. We were almost there when the tram stopped to pick us up. After a short wait, the island ferry arrived and we boarded for the half-hour trip to Cabbage Key. The Cabbage Key Inn is lovely from the outside and funky inside. The grounds are well maintained as could be seen from an observation tower on the property. 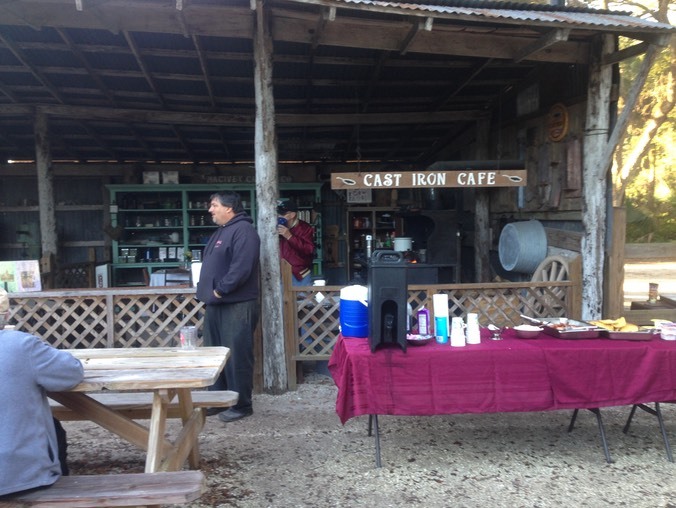 In addition to the inn, there are several rental cottages, a garage and workshop and trails around the property. But that was it as far as I could see. I guess after your cheeseburger in paradise, a dip in the Gulf, and a stroll around the grounds, you’d spend the balance of the day sitting on your porch sipping margaritas . On our return to Cayo Costa, we all crowded onto the tram for the short ride back to camp. As soon as we arrived, people disappeared like water into sand. I wanted to walk back to the Cemetery Trail and hike for a while. I looked for some company, but there was no one in sight. So I headed out on my own. I didn’t have a trail map but the Cemetery Trail was well marked. After walking a little less than a half mile, I entered the trail and soon found the cemetery. It was deeply shaded in the intense afternoon sun, surrounded by an old split rail fence. The ground was brown, a combination of sand, pine needles, and fallen leaves from the overhanging Trees. The graves were in various states of disrepair. 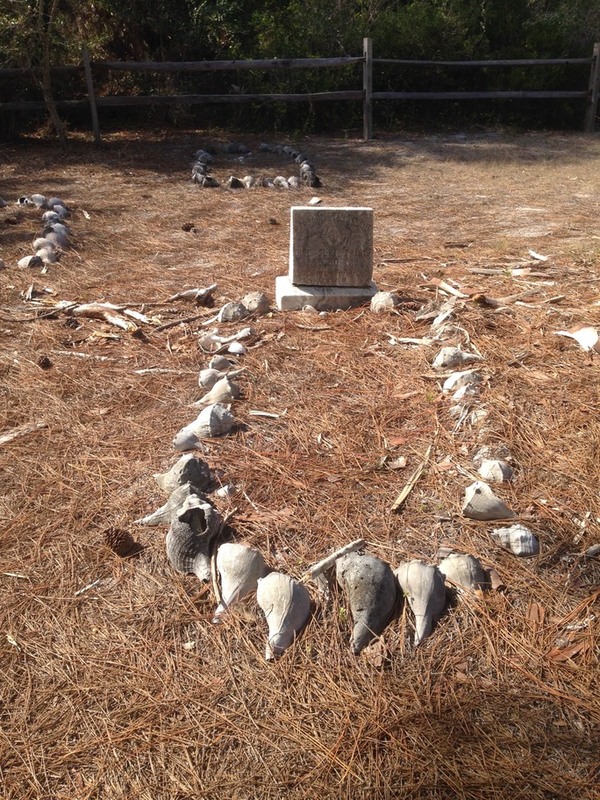 Each one was identified by a weathered headstone and outlined with conch shells. A quaint touch, I thought, and totally appropriate for the location. I continued north on this route till it intersected with the Pine Wood Trail. Still not sure of where I was going, I headed east on this heavily shaded path until I reached the Quarantine Trail. A marker told of an old dock and buildings where immigrants would be quarantined upon arrival. That sounded interesting, so I headed north. Before long I was starting to perspire and, despite the strong wind that pushed through the trees, I was getting bitten by nasty little black mosquitos. The wind in my face kept them away from most of my body, but the sneaky little buggers would get behind me and lite on the back of my legs, using them as a shield from the wind. Swatting and stomping, I got as far as the Osprey Trail when I was passed by a guy on a bike. I must have mentioned that I wasn’t sure where I was because after speeding off he abruptly turned around, stopped and handed me a trail map, for which I was very grateful. According to the map it was still more than a half mile to my destination, then two and a quarter miles back to camp. So, I decide to turn around heading south, with the mosquitos now attacking the fronts of my legs. At the junction with the Pine wood Trail, I decided to continue straight ahead. I could hear the ice cream freezer at the park store calling me, and I deserved a cold treat. After a second shower and dinner, the park volunteer arrived. I don’t have His name, but I wish I did. He and his wife had volunteered at the park for over twenty years, living way back in the woods, maintaining trails. Soon he picked up his guitar and began to sing. He was great. He must have done a ninety minute set. He said that this was something he did weekly at the pavilion for campers. DAY 7: The last day of the trip is usually an anti-climax. This day was no different. Gear and tents were packed and carried to the spot where the tram would pick them up later for transport to the island ferry. The ferry would meet us at Pineland Marina on Pine Island in St. James City. I enjoyed coffee at the pavilion with the friends I’d made on this trip and had another sinful amount of bacon. Then it was a tram ride to the docks, carry our boats to the water, and launch for the short seven mile paddle to the marina, a barbecue, and shuttle ride back to our cars at Koreshan State Historic Park.